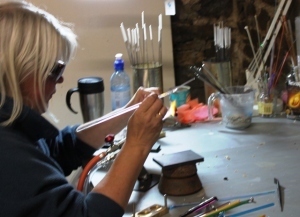 At Glass Beads by Lotti, all items you see on this website are hand made by me either in my home studio on the wonderful, wild and remote Hartland Peninsular in North West Devon in the UK, close to the raging Atlantic Coast (this is where I make the glass pieces). I make my jewellery in the studio/workshop I share with 3 other glassy ladies in Bude in Cornwall. I take inspiration from nature (we are rather surrounded by it here!) including the rugged coastline,the raging (sometimes peaceful) Atlantic Ocean and the very wind swept trees. As a teenager I started working with those tiny fiddly seed beads working with a bead loom which my sister taught me to do whilst living in Northern Canada and having been taught herself by the local First Nations people. I loved the loom my Father made for me and working in the styles of the First Nations people as I had been first taught. As I got older (as with so many things) I didn't have time for my loom any more and it was put away (with my bead stash) in the loft. About 7 years ago having moved to Devon from the edge of East Anglia a few years before, I found time again to work on my loom and enjoyed making pieces and learning different techniques and styles to make using the loom. One day I was looking in a magazine for some inspiration and saw hand made glass beads, made in the UK, a technique called Lampworking. I was amazed and excited, I have always loved glass and I just couldn't believe that I could make my own glass beads myself at home. 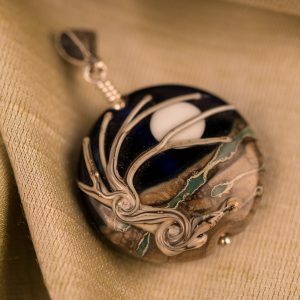 I enrolled on a course with a local very experienced Lampworker (some people also refer to this art as Flameworking, they mean the same thing) in 2010 and since then have attended other courses and study new techniques through these, through other lampworkers and through tutorials which I buy from artists all over the world. In my work I use two different types of glass, soda lime glass or soft glass; and borosillicate (boro) or pyrex which is a much harder glass and needs a much hotter working environment. My beads, cupboard knobs and light pulls are made with the soda lime glass and I make pendants, marbles, glass drops, trees and other small sculptural pieces with the boro glass. Lampworking (or Flameworking) is the art of melting glass rods (generally) in a very high temperature duel fuel torch (sort of like a really really hot and much bigger bunsen burner). The two fuels are oxygen and propane. To make beads the glass rods are melted onto s teel sticks or mandrels (these are coated in a fine clay mixture so that the glass doesn't stick to the mandrel, you want to take these out of the beads when they are cooled, and this is what forms the hole in the bead. If you buy glass beads, check that the clay mixture has been cleaned out of the centre of the bead, unfortunately many important factory made beads still have the clay inside the beads and this can form a fine dust, not something you really want in your necklace or earrings). Once the bead is made and I am happy with it but whilst it is still very hot (mustn't let it cool or it will crack), the bead is placed in a digitally controlled kiln to cool slowly (anneal), this provides some strength to the bead. This can take around 10 hours once I have finished making beads. Once the beads are cooled they are fully inspected and the holes cleaned, if I am going to make the beads into jewellery then I will do this using only sterling silver. 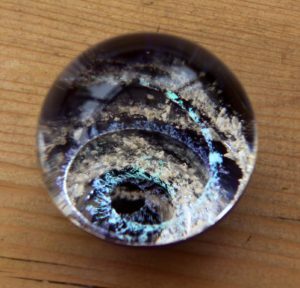 For the boro work this is done 'off mandrel' and the work is supported in the flame using small glass rods or tools so you don't burn your fingers! When I get the hang of the video on my camera (and find some time) I shall try to post some videos of me working to give you an idea of how it is all done. 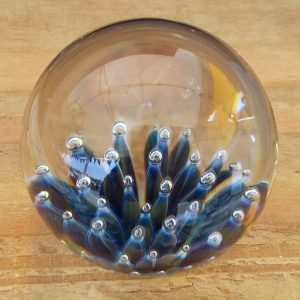 There are various videos on Youtube that you can look at to see how marbles and beads and other lampworked items are made. As part of my boro work I am now offering Memorial glass pieces to remember that special person or pet, please have a look at my Glass Memorials with Ashes page for more information. Copyright © 2019 Glass Beads by Lotti. Powered by WordPress. Theme: Spacious by ThemeGrill.